To be integrated into μMongo, those data need to be unserialized. Same thing to leave μMongo they need to be serialized (under the hood μMongo uses marshmallow schema). The unserialization operation is done automatically when instantiating a umongo.Document. The serialization is done when calling umongo.Document.dump() on a document instance. So what’s good about umongo.Document ? Well it allows you to work with your data as Objects and to guarantee there validity against a model. Note that each field can be customized with special attributes like required (which is pretty self-explanatory) or default (if the field is missing during unserialization it will take this value). You can access the data as attribute (i.g. odwin.name) or as item (i.g. odwin['name']). The latter is specially useful if one of your field name clashes with umongo.Document’s attributes. ValidationError: "Not a valid datetime." Note the Meta subclass, it is used (along with inherited Meta classes from parent documents) to configure the document class, you can access this final config through the opts attribute. Here we use this to allow Animal to be inheritable and to make it abstract. What the point of a MongoDB ODM without MongoDB ? So here it is ! Mongo world consist of data returned in a format comprehensible by a MongoDB driver (pymongo for instance). Here we decided to use the name of the dog as our _id key, but for readability we keep it as name inside our document. By default the collection to use is the snake-cased version of the document’s name (e.g. Dog => dog, HTTPError => http_error). However, you can configure (remember the Meta class ?) the collection to use for a document with the collection_name meta attribute. Remember the @insance.register ? That’s now it kicks in ! 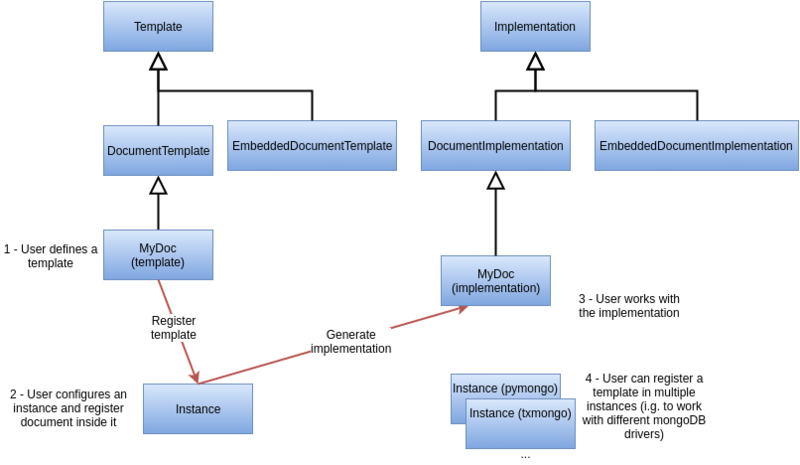 The idea behind μMongo is to allow the same document definition to be used with diferent mongoDB drivers. But enough of theory, let’s create our first instance ! >>> # Don't try to use Dog (except for inheritance) now ! You must register a parent before it child inside a given instance. This way each error message will be passed to the custom gettext function in order for it to return the localized version of it. See examples/flask for a working example of i18n with flask-babel. To set up i18n inside your app, you should start with messages.pot which is a translation template of all the messages used in umongo (and it dependancy marshmallow). Under the hood, μMongo heavily uses marshmallow for all it data validation work. However an ODM has some special needs (i.g. handling required fields through MongoDB’s unique indexes) that force to extend marshmallow base types. In short, you should not try to use marshmallow base types (marshmallow.Schema, marshmallow.fields.Field or marshmallow.validate.Validator for instance) in a μMongo document but instead use their μMongo equivalents (respectively umongo.abstract.BaseSchema, umongo.abstract.BaseField and umongo.abstract.BaseValidator). Now let’s go back to the Base concepts, the schema contains a little… simplification ! Let’s go back to our Dog document, in real life you can rename your dog but not change it breed. So in our user API we should have a schema that enforce this ! ...         data['brief'] = "Hi ! My name is %s and I'm a %s" % (data['name'], data['breed'])"
One final thought: field’s missing and default attributes are not handled the same in marshmallow and umongo. In marshmallow default contains the value to use during serialization (i.e. calling schema.dump(doc)) and missing the value for deserialization. In umongo however there is only a default attribute which will be used when creating (or loading from user world) a document where this field is missing. This is because you don’t need to control how umongo will store the document in mongo world. Now sometime you’ll need for your validator to query your database (this is mainly done to validate a umongo.data_objects.Reference). For this need you can use the io_validate attribute. This attribute should get passed a function (or a list of functions) that will do database access in accordance with the used mongodb driver. For example with Motor-asyncio driver, io_validate’s functions will be wrapped by asyncio.coroutine and called with yield from. When converting to marshmallow with as_marshmallow_schema and as_marshmallow_fields , io_validate attribute will not be preserved.